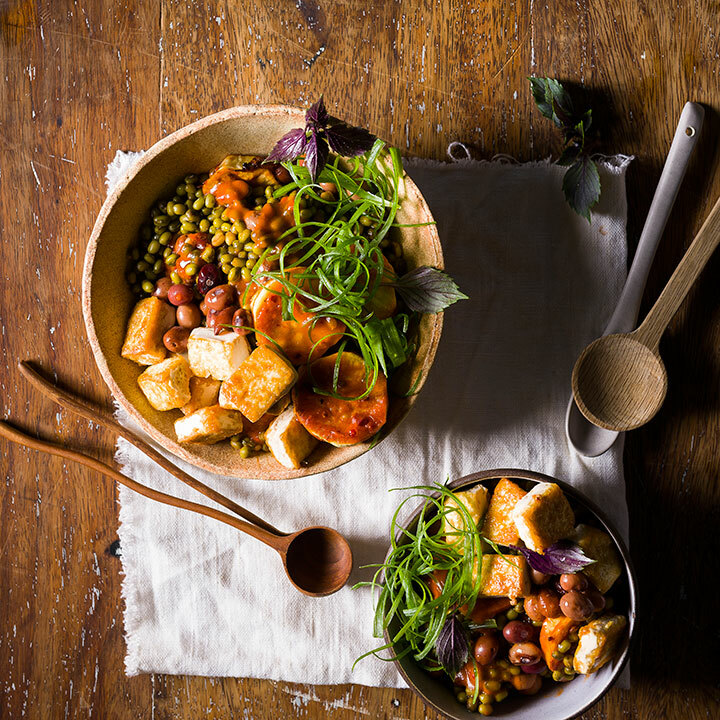 For a meaty alternative to tofu in this recipe, replace the tofu with 300g skinless, cubed chicken breast. Pour a glug of canola/olive oil in a pan placed over high heat and fry the chicken, tossing occasionally, until cooked through, 8 – 10 minutes. In a large pot, bring the water to a boil over medium heat. Add the Bambara groundnuts and boil until soft yet still slightly undercooked, about 30 minutes. Add the mung beans and continue to boil until soft, about 15 – 30 minutes. Add the sweet potato rounds in the last 15 minutes of cooking. Remove from heat and drain. Set aside until needed. Place the tofu cubes on paper towel to absorb excess moisture. Set aside. Heat the canola oil in a large frying pan over high heat. Add the dry tofu cubes and shallow-fry until golden brown and crispy, about 3 minutes. Using a slotted spoon, remove the tofu from the pan and place on paper towel to absorb excess oil. Combine the Knorr Peri-Peri Sauce and water as per the packaging instructions. Pour the sauce over the drained Bambara groundnuts, mung beans and sweet-potato rounds. Toss until coated well. To serve, divide the peri-peri mixture among 4 serving bowls. Top with the crispy tofu and spring-onion curls. Garnish with the fresh purple basil, if desired. Serve immediately.